How do you reward Kickstarter backers? Stickers. The Historical Heroines: Coloring Book was fully funded and as part of both their support levels was a "I Supported" sticker. The idea being supported was a way to educate and inspire young people about the women in science. To do this a fun coloring book was created. "What if there was a coloring book that inspired the young people in your life to not just be creative, but to learn from and feel inspired by historical, strong, pioneering, brilliant women in science? Introducing 'The Historical Heroines Coloring Book: Pioneering Women in Science from the 18th and 19th Centuries!'" The coloring book celebrates over thirty women scientists, who during their time period had trouble even going to college. They broke the mold and followed their own passion. The book is created by Elizabeth Lorayne, who also wrote the children's picture book series, The Adventures of Piratess Tilly. If inspiring and educating kids wasn't enough to support the cause, custom stickers stating that support are clearly a good add in for backers of a Kickstarter campaign. This sticker marketing strategy is brilliant because it gives supporters something tangible to proclaim how they were involved from the start. 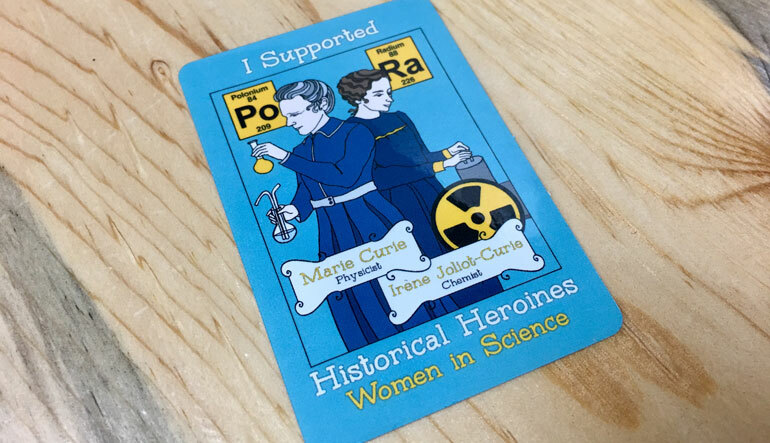 The Historical Heroines sticker design was printed up as Kiss Cut Stickers showcasing the physicist, Marie Curie and chemist, Irène Joliot-Curie. It states around the image "I Supported Historical Heroines Women in Science." It is a perfect 2 x 3 inch size that makes it great for laptops, tablets, water bottles or beakers. Just kidding, beaker's are probably not a safe place for a sticker longevity... it's science. The formula of stickers and a Kickstarter campaign passes all the tests as The Historical Heroines coloring book has come to life.